Selling people beer for a living is often seen by those outside the industry as a dream job – what could possibly be better than talking about beer all day to people just as passionate as you are? 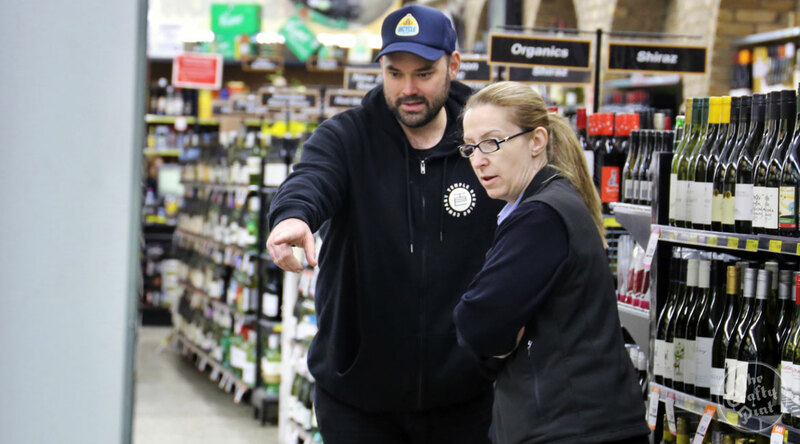 For the first in our new series in which we peer behind the curtains of the fast-growing craft beer industry to see just what it takes to get great beer into your hands, we take you through a day in the life of a beer rep. Specifically, Dave Myers of Melbourne’s Temple Brewing. We spent a day riding with Dave, as he gave us an insight into the nature of the craft beer business, what beer reps call the "Friday afternoon special", and how someone trying to crack the industry can give themselves the best chance possible of doing just that. Just one warning: there’s always an element of luck. 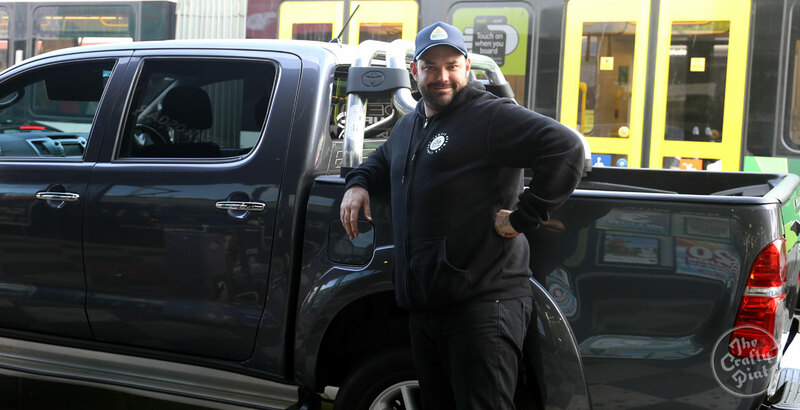 Dave Myers starts off his day by dropping in at Temple Brewing in Brunswick East to grab samples, check in with the brewing team, and collect tap handles or decals for customers. 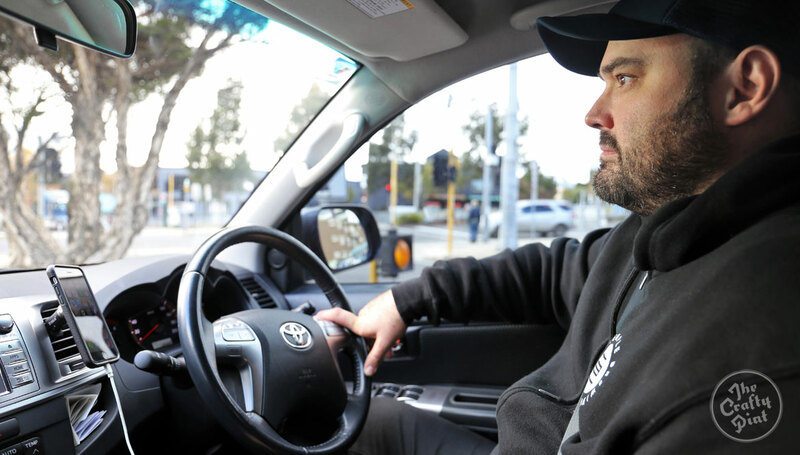 Once a few emails and calls are out of the way, he’ll spend most of his day on the road in his Toyota Hilux, ducking across the city from customer to customer through a mix of planned meetings, cold calls, and drop ins. While he took the time to clean out the car before we rode along for the day, he explained that a rep’s car will usually be decorated with a combination of coffee cups, decals and even kegs, depending on the day’s requirements, as it becomes their office away from the office. Want to get into beer repping? Then make sure you’re ready to clock up the kilometres. How long have you been a beer rep and how did it come about? For six to seven years. I did a very brief stint at Rocks Brewing in Sydney, then Camden Town Brewing for three months, but before that I was at Little Creatures for five or so years. Before that, I started out working at a bar and was selling heaps of Coopers, which made me want to be a Coopers rep as I’d fallen in love with their beers. Their rep told me I needed to "be in the movies to be in the movies" so to speak – I needed to get a sales job to actually get a sales job. To do that, I sold wine on commission for two years before I ran out of money because 10 percent commission on a box of wine isn’t very much at all. I luckily got a job for the Little Creatures rep at the time doing his tastings, but he resigned before I even started, so I ended up with his job. The moon aligned with Jupiter, and I got really lucky. What has changed in the industry since you started? Is it still a case of all the beer reps knowing each other? It hasn’t changed too much at all – we all meet up on Friday for lunch. It’s still just as close knit now as it was when I started. There are a fair few more people, but everyone’s still mates with each other. How does that differ from the world of wine reps? No white buttoned up shirts here. It’s the complete opposite. Wine reps are more focused on their own business, would never say hello to each other, and will cut you to get a sale. They’d never share their leads, for instance. It’s really cutthroat. One of the greatest things is watching a wine rep coming over to craft beer, because you can just watch them slowly losing the black pants and white buttoned up shirt, cracking jokes with their fellow reps, and putting some jeans on. They can finally start to relax and enjoy life instead of stressing out about every single sale. What is the work-life balance like for a beer rep? It’s not drinking beer every day and just always having a great time. There is plenty of stress, but it’s about 50:50. There’s less pressure on getting sales across the line against all odds, because it’s more about building good relationships. 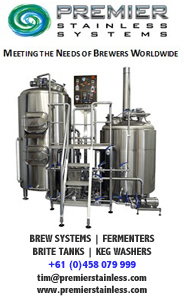 Are venues expecting more from breweries these days? I did a few years with Little Creatures in Queensland, and we did really well because we were one of the few breweries who could consistently get beer up there and out to the market. We’d get taps simply because we could make sure it was available. You’d just walk in and get a tap, and it was your tap for six months to a year. Now, most beers go on for one keg, and then it’s gone. The competition is getting tighter, and you’re up against things like pub groups insisting on buying kegs at set prices. It’s a case of either meeting the prices or moving on. That’s just what you’ve got to roll with now, because they know they can have you up against the wall to get the business. How do you balance your relationships with other reps or breweries, while making sure you are getting beer sales across the line? Everyone understands that sometimes things just happen and it’s often beyond the control of the breweries. I just go out and try and do the best that I can. I’ll always apologise if I may have pinched someone’s tap point, but as much as it does keep me awake at night, at the end of the day you’re just offering your products as best you can to a customer. If they accept that over someone else’s, then that’s their decision to make. It goes the other way too – if I get a sale and they ask me for recommendations of other breweries, I’m always happy to do so. You recommend your friends, and you recommend your favourites. That’s part of the way we all work. What is some of the etiquette in dealing with other reps while out visiting venues? If you see someone in a venue, you try and make your way out as soon as you can, unless they ask you to stay. There are some younger guys around who think it’s cool to come in and bust in on your call, or start trying to sell their beer over your beer. We have created this world of friendliness and inclusion, so it’s a natural byproduct of that. Sometimes you want to run a specific deal for a venue, or talk about pricing, so you need that privacy, but 90 percent of the time it doesn’t really matter. But that one special time you’re trying to be the pushy guy, someone will inevitably walk in. What kind of complications might pop up in the course of a beer rep’s day? Dave contemplating his response to this week's Friday afternoon special. Possibly. There’s the "Friday afternoon special" of a coupler request at 3.45pm, or a keg not pouring properly. Inevitably, it’ll happen when you’re busy and you’ve overbooked yourself by two tastings, and you’ll see that name pop up on your phone and you’ll know straight away they’re not just calling to say hello. You get the repeat offenders; they know who they are. But this job wouldn’t be this job without them. You’ve got to love Friday afternoons. The people. Getting to interact with people across the industry, like brewers, bar owners, and the other reps. It’s an incredibly rewarding industry to work in. The people. Playing the old game sometimes where you walk into somewhere you’ve dropped samples off a thousand times, and they ask for samples again, or they say their boss loves one of the beers, but they want yet another sample before they tap the keg. But in the scheme of things, if that’s the worst, then you’re doing pretty well. What advice would you have for someone wanting to get into selling craft beer? Be ready to deal with rejection, because it’s not as easy as you think it is dealing with people. It’s not all beer and skittles. There is a lot of rejection, and most of the time it takes a long time to get things off the ground, so you have to have patience. But once you’ve got good momentum it all just starts to come together. Trying hard to immerse yourself in it, and being around beer people really helps too. Then, once you’re in it, you can draw information from all of your beer contacts. We’re all there to help each other out. What skills do you think would be useful for a potential sales rep? Having a passion for it is essential, but it’s also about being open to learning things. You shouldn’t ever close yourself off, thinking that you already know everything. At no point should you ever think that, because you learn so much from just being around different people, especially around brewers. There are so many opportunities to learn things off good people. I got into it through doing tastings, which is a good lead-in. Tastings and festivals are good places to start, because you’re dealing with people at that level from both sides of the sale. You do have to be a salesperson, or at least start to know how to sell. It’s not all about the cuddly side of things. But inevitably, part of getting that first job is sheer luck. What is one of the strangest things you’ve dealt with as a rep? A fellow rep from Stone & Wood in Queensland asked me to cover a tasting at a venue he knew I’d been wanting to get into. It sounded like if I went in there, they’d probably put my beer on, so of course I agreed to do it. There was an interesting vibe in the room on the night. Usually at beer tastings it’s quite hands off, but everyone there wanted to shake my hand. Ladies, gentlemen, everyone. Then the curtains got drawn on the room we were in, and a woman asked for me to pass her a bowl that was behind me. The bowl was full of names, and I realised I was pouring beer at a goddamn swingers’ party. I exited stage left pretty damn quickly, but the wine rep who was next to me decided to stay! How do you see the industry changing in the next few years? The way I see it, everyone will in time reach that point of potentially getting bought out – I’ve got my ideas on who might be next. All that happens when a craft brewery gets sucked up into the machine is that the craft beer followers slowly move on from that brand that has been bought out. In turn, that brewery moves up the chain and clears all the space they used to occupy in our tiny little community, opening the way for more breweries to get onto those taps. 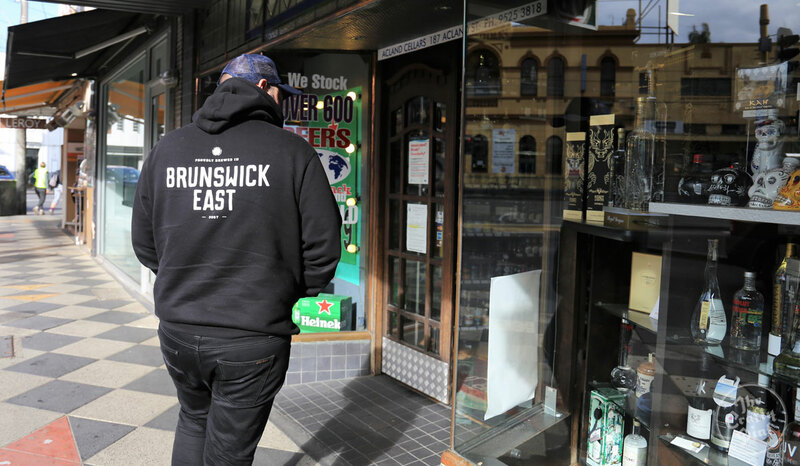 At the same time, bigger pubs can now introduce their customers to breweries like Little Creatures and Mountain Goat, and that’s an amazing thing when they might previously only have had Carlton Draught or Toohey’s New or XXXX. Craft beer brands are now in bigger pubs, exposing them to more drinkers, which can lead them through into our little world. It can only get better – it opens up the way for all of us. Thanks for your time, Dave, and for being so open with your thoughts on the business. If you're looking to get into the beer industry, keep an eye on the Crafty Pint Jobs page too, as we post a few new opportunities every week.